Beautiful flat weave rug. We placed the rug in our mudroom and, with the black and off-white colors, the rug doesn't seem to show dirt that is tracked inside. While it is thin and doesn't offer cushioning, it also says flat and doesn't roll or curl. I wanted a neutral runner for my bathroom. The colors of the rug make it neutral, and the design makes it interesting. 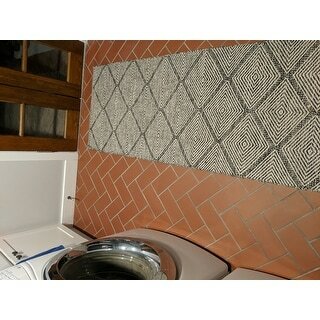 I think this rug suits a variety of decor styles, from farmhouse to modern to Scandinavian. Like all cotton rugs, it needs a nonslip pad under it. I'm very pleased with the quality and looks of this rug. I researched runners for a long time waiting to find the perfect look for our hallways. These are perfect! Love the look. You will need to purchase a non slip pad for underneath. You can’t beat the price on these high quality runners. The most beautiful rug. Great for the cost. Beautiful rug! I have had multiple compliments! I have it in my bathroom and it fits perfectly along side the tub and vanity. Color brings out the best of the white and black tile. Most of all, I love soft and warm feel on my feet. This pattern is beautiful and a great way to add texture to a small space. It definitely needs a non-slip grip rug underneath. It moves around a lot without one. Nice rugs. Soft under foot. Definitely need a non-slip pad underneath. 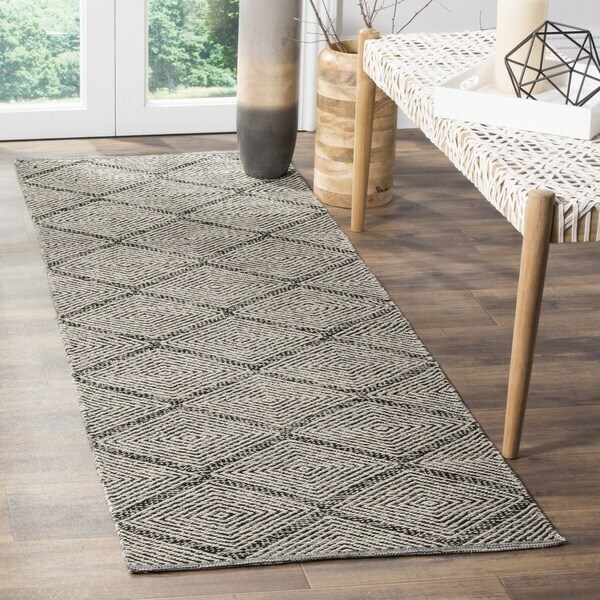 Really like this rug and receive compliments, simple and modern, matches with furniture easily. We had it at the front door and then decided we liked it better in the kitchen. Looks great on wood flooring. Good quality too. I love this rug! It's held up in our kitchen - very high traffic. It washes and dries well. I've received lots of compliments too. Great fabric! Looks amazing with my light grey wood floors! Love it! Buying 3 x 5 to go with it. Awesome rug! Goes perfect in front of our bathroom sinks, but it has a very weird odor. Apart from that little thing we love it. Has good reviews and like the color. "Is it exactly 2 feet or is it 2’3” like many other of your runners?" This rug measures 2’3 x 7. We highly advise against machine washing this rug. We recommend spot cleaning and light vacuuming (without the beater bar) for most of our rugs. For large stains, we recommend professional cleaning.